Bengaluru FC is a side which has won almost everything to be won in their short existence of six years. 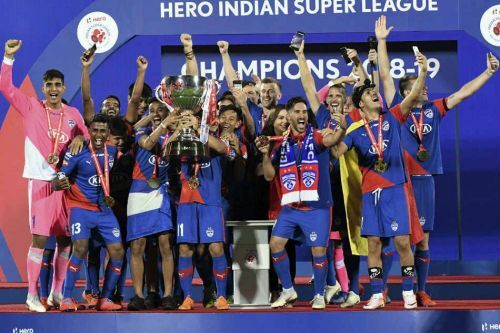 From the Federation Cup, I-League, Super Cup to the Indian Super League, the Blues have added it all to their Trophy Cabinet, making them the most successful Indian Club in recent years. The JSW-owned Football Club have made headlines very often across the Indian Sports Media with their massive Social Media presence and professional administration, resulting in successful seasons, year-in-year-out. This season was no different as well. The Blues topped the league stage of the Indian Super League (ISL) courtesy their consistent performance throughout the four months with just four losses and as many as 10 wins. They outperformed NorthEast United FC in the semi-finals and made it to the final, where an Extra-time header from Rahul Bheke scrapped Bengaluru FC through to their maiden Indian Super League title. 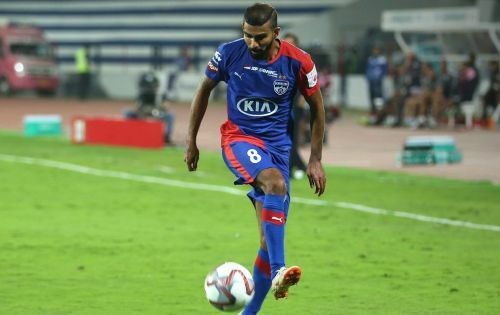 However, Bengaluru FC could not repeat their Super Cup 2018 feat this season, losing to Chennai City FC in the quarter-final to end their season. The Blues might have had a very successful season as usual, but several of their key players may part ways with the club at the end of this season with reasons of their own. Some of them are as follows. After making Indian Football headlines, being one of the very Indians to play in the American Football System, Kean Lewis has come a long way. After his tenure with Fairleigh Dickinson Knights, Houston Dynamo and Laredo Heat, he returned to India. Since then, he has featured for Mohun Bagan, Delhi Dynamos and Pune City before signing up for Bengaluru FC prior the 2018-19 season. Carles Cuadrat has failed to use the pacy winger and makeshift attacking midfielder to his full potential. Lewis got to feature in 15 of the 18 League stage games, but mostly as substitutes with just a totality of 529 minutes under his belt. The Goan failed to make any impact with his skills and just managed an assist in the entirety of the season. The surfeit of quality wingmen and midfielders in Bengaluru FC just hasn't allowed Kean Lewis to show the quality he possesses on the pitch. Lewis' contract expires at the end of May 2019 and there is a good possibility, the Indian winger moves to a new Club for professional reasons.